Published: Saturday, May 21, 2016, 12:01 a.m.
ARLINGTON — The walls are going up for a new entryway and an expanded preschool and daycare at Our Saviour's Lutheran Church on East Highland Drive. The Mission Builders, a national organization under the Evangelical Lutheran Church of America, sent 10 workers to help church volunteers and contractors finish a 3,000-square-foot expansion and interior renovations at the church by September. Our Saviour's Lutheran Church has been in Arlington for 124 years. It moved to its current location at 615 E. Highland Drive in the 1970s and is in need of an overhaul. The preschool is the biggest piece of the project. Bill Graves, director of Mission Builders, said that most Mission Builder volunteers spent their working years in other areas. Graves was in pharmaceutical development marketing. Jim Dyess, project manager at Bethel Lutheran was a geologist. 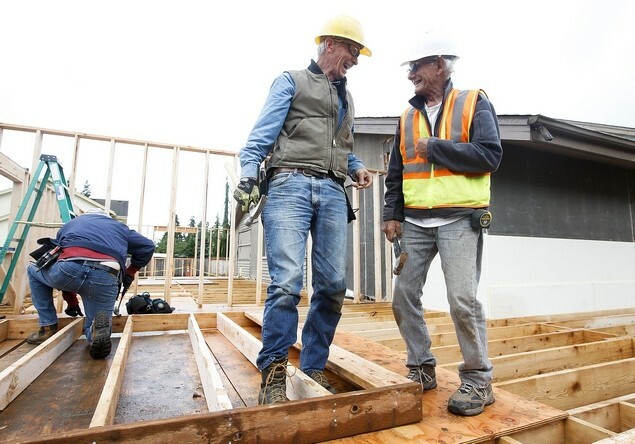 Although few people who join Mission Builders have building experience, Graves said they spend a lot of time in training, especially safety training so the job site is safe and workers follow correct procedures. Being a Mission Builder requires willingness to learn and flexibility since they must leave their homes for months at a time and travel to a job site. Most members live in RVs while on a project, preferably at the job site, which provides security for the building and allows them to become part of the community. Projects can range from two months to longer than a year. “The length of the projects really varies. We try to get them done in said months,” Graves said. When the Mission Builders leave projects, most still require finishing work but some are turnkey. This flexibility to be gone from home for months at a time is the reason that Mission Builders reaches out to retired workers. Retired, but definitely not ready to be done with meaningful work. “The average age of Mission Builders is well north of 65,” Graves said. But they are committed and have strength in numbers. “We are away from families and homes, but we’re dedicated to the project and dedicated to making church communities stronger,” Dyess said. According to its informational materials, Mission Builders provides project management oversight and labor. It also coordinates subcontractors hired by the church for plumbing, electrical and HVAC installations. When a church’s building project begins, the Mission Builders assigned to the project arrive and quickly become part of the church community. They live in RVs at or near the site and become employees of the congregation. Dyess said the Mission Builders work to help churches and individuals believe they can do things they didn’t know they could do. They hope that this belief stretches beyond construction and into other parts of church life, inspiring churches to reach out to help in their communities. JoAnn Dullum, a member at Bethel, shared her opinions on what changes she thought the church needed to make in its building structure. Because she had expressed opinions, she decided she had better help make the changes a reality. “I wanted to see some changes so I needed to be part if it,” she said. Because Dullum works full time, she wasn’t sure if she could find space in her schedule to help. At first she went in the evenings after construction was over and she cleaned up sawdust and nails for a couple of hours. Then, the Mission Builders decided to work late on Wednesdays and work on Saturdays so that people with jobs could volunteer during project hours. Dullum showed up and soon was learning how to hang siding. “I’d never hung siding. Never knew I would learn to hang siding,” she said. The builders also taught her how to nail in braces to support the walls. “A couple of weeks ago I was working on the trusses,” she said. “They showed me how to do these things.” Dullum admitted that her nails were never straight and that she ended up needing to use more nails than some people, but it didn’t matter. When the building committee at Bethel was getting ready to start its capital campaign, Patty Braget and fellow committee members met with members of Hoover’s church in Helena to learn more about Mission Builders. Mission Builders and spouses at different homes for supper each night. Sunday, the Mission Builders had a stud signing in the church and the sheer number of names, comments and Bible verses covering the exposed studs were proof of how many people have been involved in providing labor, food, prayers and financial help. Dullum said the project has helped her get to know people that she didn’t know before. “You go to church together but don’t always know each other,” she said. Working side by side, though provides a chance to talk. “We have a mission. It’s brought us together as a congregation,” Dullum said. The Mission Builders will be finished at the end of the summer, planning to leave the church locked in and water tight with all the services ready. “They’ll leave us where we just need to do insulation, Sheetrock and finishing,” Braget said. Bethel member Tim Lightborne will take over as project manager. And, although it may still hire out some of the finishing work, the church will have saved money by using Mission Builders and doing a good share of the work themselves. When the Mission Builders leave, Dyess said it can be hard. “It’s emotional to say goodbye to those people. But it’s a tradition that Mission Builders go back for the dedication, usually a year later.” Because relationships are built during the months that Mission Builders work on a church, Dyess said it’s not uncommon for members to return to a congregation to see people and catch up with friends. When they are at a site, they not only build with congregation members, they worship with them on Sundays and they have daily devotion and prayer time with volunteers. Because of this, they do become part of the life of the congregation. There is a financial aspect to Mission Builders. They can save a congregation hundreds of thousands of dollars in building costs. But that is an aside, Dyess said. From left, Ted Erkenbrack, Bob Risberg, Les Sitz, Ed Nieman and Rich Hofer, are volunteers from Mission Builders working on the Crown of Glory expansion in Chaska. Dennis Smith is wearing a Green Bay Packers hard hat. Rich Hofer is donning a Minnesota Vikings one. But despite backing rival football teams, the two men have found common ground on the construction site. Smith and Hofer are two of the 10 or so workers with the group Mission Builders who are helping Crown of Glory Lutheran Church complete its 18,000-square-foot expansion project in Chaska. The 46-year-old church is adding space to its sanctuary, fellowship hall and expanding its educational wing. The new design will take advantage of the church’s perch on the bluff near Highway 41 and Victoria Drive. But right now, there isn’t much time for the volunteers from Mission Builders to enjoy the view. They are on a fairly strict schedule, working Tuesdays through Saturdays, to get the building watertight by winter. “We’ll be here until mid-October or early November,” said Ted Erkenbrack, construction foreman. Mission Builders has been contracted to work hand-in-hand with volunteers from Crown of Glory to complete the $3.2 million project. Mission Builders volunteers are paid minimum wage for their efforts. Erkenbrack got involved with Mission Builders when they were contracted to help build his church Living Waters Lutheran Church in Lino Lakes. It was a great fit for his background in construction. “We’ll work with anyone affiliated with the Lutheran Church,” he explained. They’ve done 3,000-square-foot additions up to 27,000-square-foot additions, and Erkenbrack has traveled to Washington, Wisconsin and North Dakota for the work. Projects for everything from churches to schools are submitted to Mission Builders and volunteers can sign up for work that interests them. In the winter, a lot of the interest is in projects in the south. In the summer, many volunteers find the northern climate more appealing. Crown of Glory’s expansion has a mix of volunteers from around the country including Texas, Arizona, Florida and South Carolina. Erkenbrack spends his weeks at the church and heads home on the weekends. During the week, after hours, Erkenbrack said there is a lot of fellowship among the group. Some of them have worked together before while some are new faces. Erkenbrack said there are some familiar faces on this project from a three-year stint many of them shared rebuilding a church in Minot, N.D. following a flood.